The Makeup Curio is a boutique style business fused with an esthetics only salon that offers a unique blend of beauty, bridal, theater, skincare, and special fx. We sell wildly popular indy makeup brands like Graftobian, Gleam by Melanie Mills, Rubber Wear, Bdellium Tools, SmudgeFIXX, and more. Typically found in online markets, The Makeup Curio brings these brands locally with the ability to test products in studio, and on location, at various events around the Capital District (Albany, Schenectady, Troy, Saratoga Springs) and the Northeast. Workshops for budding makeup artists include zombie creation and old age. Makeup services include options for brides, special occasion, makeup design for theater and film , and Halloween applications. Other esthetic services include facials and waxing . The Makeup Curio is the creation and vision of Jenn Dugan. Jenn has an extensive background in theatrical costumes, hair, and makeup. Having received a Bachelors Degree in Fashion Design from Marist College in 2004, Jenn went on to freelance around the country in the world of entertainment. 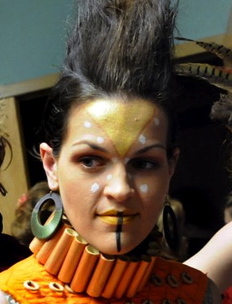 Because many smaller theaters had low budgets, as a costume designer, Jenn also frequently designed the hair and makeup. A self taught makeup artist, Jenn learned through books, interacting with other professionals, and trial and error. She has since transformed clients for their wedding day, fashion photos, film shoots, Halloween, and theatrical performances. In addition, Ms. Dugan holds an Associates Degree in Business Administration from Schenectady County Community College. In Spring 2016 she completed the Capital Region Chamber's Entrepreneur Bootcamp, having won second place in the business plan competition in presenting The Makeup Curio. Along with her Fashion Design and Business Adminstration degrees, Jenn acquired her NYS Esthetics License in July 2017.